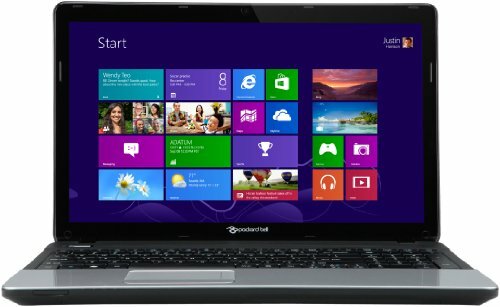 Below is our review of the Packard Bell EasyNote TE, a 15.6" laptop, featuring 6GB RAM, 500GB hard drive and Windows 8 64bit. Processing duties are handled by the Intel Celeron B830 which operates at 1.8Ghz - this is a fairly standard processor at this end of the laptop market, and offers good performance, handling multi tasking duties pretty well. The display measures 15.6 inches and has a standard resolution of 1366 pixels by 768 pixels - we found the display to be crisp and offered good contrast and vivid colours - you will be able to adjust this to reflect your environment and personal preferences. HDMI output is also included, so you will be able to output your display to either an external monitor or a TV with HDMI input. The 500GB hard drive operates at 5400rpm - we would have liked to have seen a 7200rpm model in here ideally - that said the hard drive offered fast access, and more than enough storage for most users - so no issues with storing your music, files and software. The whole system runs fairly quietly - with the hard drive and fan not creating too much noise or warmth during our test period. Also included is an crisp HD webcam and a DVD drive, as well as a Multi-Card Reader. Connectivity is provided by three USB 2.0 Ports, a VGA Port, an HDMI Port, Ethernet LAN Port; Headphone/Microphone Port; DC-in Port, as well as the aforementioned DVD drive and multicard reader. As a budget laptop, it's casing is mainly constructed from black plastic - however it does feel sturdy and strong to the touch, and shouldn't have any durability issues at all. The black colour shouldn't date too badly either. The keyboard was pretty comfortable to type on, and the touchpad offered good control over the notebook - no issues to report here in our testing period. Battery life was pretty good - around average for a laptop in this price bracket - although you will be able to increase this by reducing screen brightness and other settings. Weighing in at around 2.5kg, this notebook isn't too heavy compared to the average laptop, so ideal for travelling or commuting with. Inside the box you'll find the Packard Bell EasyNote TE laptop, an AC adapter, and a user guide. Cons: There isn't a solid state drive fitted, although in fairness very few laptops in this price range have these fitted. To conclude – a decent entry level laptop, made by Packard Bell, offering the latest operating system - you could do a lot worse than to purchase the EasyNote TE.